Universal Heavy Duty Ground / Floor Demonstration Stand / Kiosk for Samsung Galaxy Tab / Note Tablet : allputer.com - Accessories for all your Portable Electronics & Computers! Trendy aluminum alloy made heavy duty floor stand for Tablet / iPad with lock. The tablet holder is 360 degree rotatable for portrait or landscape orientation. The built-in lock can prevent tablet from theft. The stand is heavy enough (around 7kg Net) and not easy to fall over. 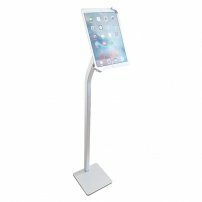 The stand is perfect for presentation and interactive system display. It is good for running in-store display demos, trade show booth presentations and even school exhibits. - 60 degree adjustable viewing angle, shift from landscape to portrait freely in a second. - For Some Tablets, there will be a small gap between holder and tablet, please use a small insert to fill up the gap. - No cables will be included you may contact us if you need an EXTRA LONG cable to get your tablet / iPad Charging while using for this stand, please contact us. - The product in this page is shipping UNIVERSAL HOLDER, if you need a dedicated holder, please browse to find the model with dedicated holder. - Ships in 7 days. - Clamping Depth: mm Min. - Clamping Depth: mm Max.